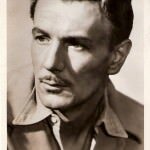 Actor on stage, television and film; father of Corin, Lynn and Vanessa Redgrave. He was born to theatrical parents at No. 4 Horfield Road, just off St Michael’s Hill, Bristol. The house is marked with a blue plaque. When Michael was about 6 months old his parents separated and his father emigrated to Australia. Michael studied at Clifton College, Bristol, a fact commemorated in the Redgrave Theatre, which he opened in 1966. He acted in several school productions in 1923-5. In the mid 1930s he began to make his name in the theatre, and continued to act and direct until the 1970s. Although he starred in films such as The Stars Look Down (1939), The Importance of Being Earnest (1952) and The Dambusters (1954), he is best remembered for his theatrical roles, twice winning the London Evening Standard Award for Best Actor. 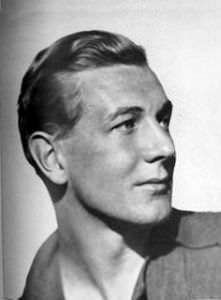 The BBC documentary Michael Redgrave: My Father(1996), narrated by Corin Redgrave, discussed Michael’s bisexuality in some depth. Rachel Kempson recalled that when she proposed to him, Redgrave said that there were “difficulties to do with his nature, and that he felt he ought not to marry”. She said that she understood, it didn’t matter and that she loved him. They married in 1935 and stayed together for fifty years until Michael’s death. Redgrave’s male lovers included Noel Coward in the late 1930s. 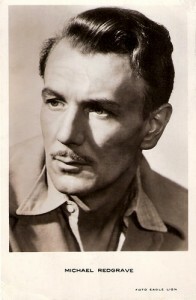 During the filming of Secret Beyond the Door… (1948), Redgrave met Bob Michell. 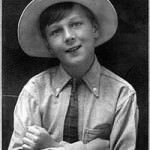 They became lovers and Michell set up house close to the Redgraves, becoming a surrogate uncle to Redgrave’s children (then aged 11, 9 and 5) who adored him. Michell later had children of his own, including a son he named Michael. Michael admitted to his son, “I am, to say the least of it, bisexual”. 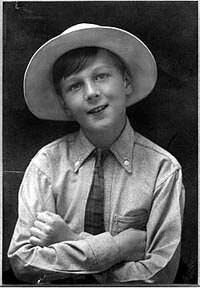 Corin encouraged him to acknowledge his bisexuality in his last autobiography. Michael agreed, but in the end he chose to remain silent. “The word is love. Surely one fearless kiss would cure the million fevers”. It was signed “Tommy, Liverpool, January 1940”.